This little paper-bound book includes descriptions and brief histories of the people and principal landmarks of the world, illustrated with maps and with tiny woodcuts. Each lesson concludes with questions to be asked by the child’s instructor; and footnotes explain the principles behind the lessons presented. The history of Asia begins with the creation of the world and of humans, as described in the Old Testament. My copy of the 1831 edition is too fragile to present in its entirety; but I’ve included some excerpts which include what is perhaps Goodrich’s most famous piece: a poem summing up the principal features of the globe. It was, L.H. Martin pointed out in The Congregationalist in 1897, one of the best-remembered pieces Goodrich wrote. 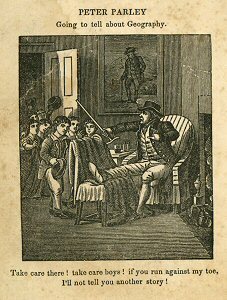 The most-remembered illustration was the frontispiece, showing Peter Parley—gouty foot on a stool—warning his lively young audience not to jostle him. I’ve tried to give an indication of the various font sizes used in the book. Going to tell about Geography. Take care there! take care boys! if you run against my toe, I’ll not tell you another story! H. AND F. J. HUNTINGTON. BALTIMORE; THOMPSON AND HOMANS, WASHINGTON. The author of this little book, has sought to give to a work designed principally for the use of schools, the attractive qualities of books of amusement. As fiction derives its interest from its resemblance to truth, I can see no reason in the nature of the case, why matters of fact may not be presented in a guise to captivate youth, as well as matters of imagination. One of the principal sources of interest in the inimitable tale of Robinson Crusoe, is the appearance of reality which the author has thrown over the narrative. Now if fiction thus borrows its attractions from truth, why is it necessary to deal so largely in fiction in the instruction of youth? Perhaps the sarcasm of the player, to the preacher, “we represent fiction as if it were truth, and you preach truth as if it were fiction,” is applicable to this subject. The cold and formal style of most books of juvenile knowledge, is probably the real cause that has driven parents and teachers to the use of books of fiction for children. In the present work, I have ventured to treat a subject usually presented in a systematic form, in a somewhat colloquial manner, taking often a story-teller’s latitude in the use of phraseology, in the method of illustration, and in the arrangement of facts. I have not hesitated to repeat several times the same thing, whenever it might better suit my purpose. rites of religion,—and of most of the elementary ideas of Geography, long before the abstract notions which constitute the rudiments of grammar, for instance, are formed. They also understand names and modes of speech belonging to the former, much sooner than those belonging to the latter. It is this adaptation of Geography to early instruction, that has brought it into almost universal use, as a first study for children. I have sought to make it a still fitter subject for this purpose, by suiting the language and the manner of its exhibition to children, and by presenting numerous cuts for the purposes both of illustration and association. I do not pretend to have gone as far as I could have wished in conforming to my own idea of a good Geography for children, but until something better is furnished, I offer this to parents and teachers, and hope my little friends may find it amusing and instructive. I hope I need make no apology for having availed myself of occasional opportunities to inculcate lessons of morality and religion upon the youthful heart. The heart is as capable of being taught as the intellect, and happiness depends much more upon its proper and right cultivation, than upon the cultivation of the mind. Yet I fear that the moral part of children, the source of feeling and sentiment is often left to run to weeds, and consequently shoots up into wild, irregular, and sometimes over-mastering passions. The sooner the juvenile bosom can be made to feel the gentle and genial influences of truth, love, humanity, and religion, the better. A principal thing to be aimed at on this subject, is to adapt moral instruction to the character of those whom it is designed to benefit, and carefully to avoid wearying and disgusting children with unsuitable and unseasonable admonition. Questions to my little Reader. What place do you live in? Is it a town or a city you live in? What is a town? What is a city? Which way is North? Which South? Which way is East? Which West? Have you ever been in any other town or city than the one you live in? If you have, what was the name of that town? In going to that town, which way did you go? What town lies next the place in which you live, on the north? What town is next, on the east? What next, on the west? What next, on the South? Do you know what a County is? Which way is Boston from the place you live in? Have you ever seen a river? Have you ever seen a mountain? If you have, what was it called? Did you ever see the sea, or ocean? What is the sea, land or water? Is the land smooth and level, like the water? Are towns built on the water, or on the land? Do animals such as horses and cows live on the water, or on the land? Did you ever catch any fish on the land? Where is the sky? Where are the stars? Did you known [sic] what the shape of the world is? Did you ever hear of England? Did you ever see anybody who has been in England? Do you know which way England lies? Did you ever hear of Asia? Do you know which way Asia lies? Did you ever hear of Africa, where negroes come from? Do you know which way it lies? The parent or teacher can prepare the pupil to enter upon the following lessons, by addressing to him a series of questions like the preceding, and when the pupil is unable to answer, by instructing him how to do so. The questions will need to be a little varied to suit the different circumstances of pupils. GENERAL DESCRIPTION OF THE EARTH. 1. Here is a picture of the World, or the Earth we live upon. It is round you see, and seems to swing in the air like a great ball. It is surrounded by the heavens, or a sky and stars. 2. The surface of the world is divided into land and water, as you will see by the picture. Men live on the land, and build towns and cities upon it; animals of various kinds also live on the land; vessels sail on the water, and fish live in the water. 3. Vessels sail around the world on all sides of it, as a fly would crawl around an apple. If you look at the picture, you will see vessels sailing in various directions. 4. Men and animals live on the land on all sides of the world. They have a sky and stars above them, let them be in what part of the world they may. If you were to go to Asia, or Africa, or any other country, there would still be stars over your head. 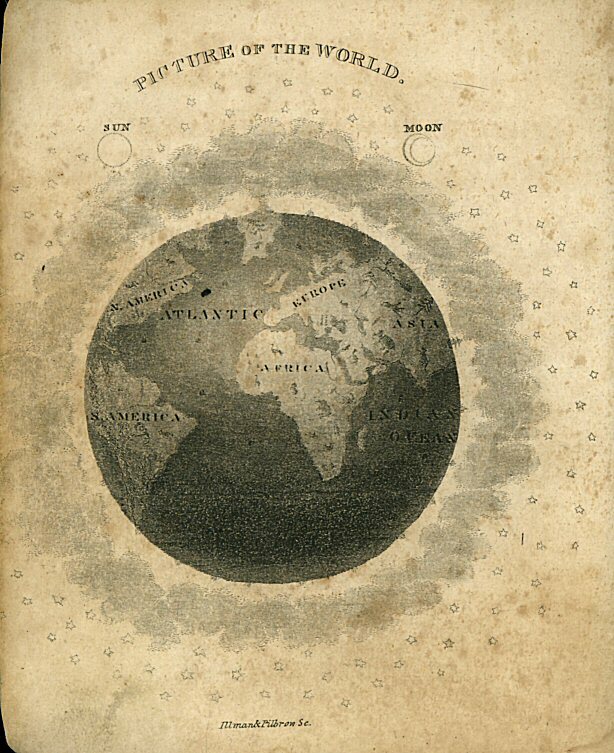 The only purpose of the engraving that faces this page, is to convey the general idea that the earth is a globe or ball, and that we inhabit its surface. Of course, nothing like the relative proportion of the objects is attempted in the representation. 5. Now geography is a description of the world; it tells us of its shape, and how it is divided; and it describes the men and animals that live upon it. Geography is therefore a very useful and interesting study. I am now going to ask you some questions to see if you remember what I have told you. 1. What is the shape of the world or earth? What does it seem to swing in the air like? What is the earth surrounded by? 2. What is the surface of the earth divided into? What live on the land? What sail on the water? 3. Like what do vessels sail around the earth? What can you see in the picture sailing on all sides of the earth? 4. Do men and animals live only on one side of the world, or on all sides of it? What do men see above them, in all parts of the world? If you were to go to Asia, or Africa, what would you see above you? What does geography tell of? Is geography a useful and interesting study? Note. One of the first things to be taught a child in Geography is, that the world is round, and that men and animals inhabit its surface. Simple as the idea seems to be, it is one not easily received by children; and therefore at the end of this lesson, the teacher or parent should make the pupil understand it, and correct at the outset the crude and erroenous fancies which he will be apt to form. The use of an artificial globe will make this a very easy matter. … I hope you will recollect what I have told you, but, lest you should forget, I will put it into rhyme, and you may learn it by heart. TO BE REPEATED BY THE PUPIL. And stars are shining there. But ships sail on the sea. With level plains we view. White, black, and copper red. All sorts of fishes swarm. I’ll set them all before you.